I do keep some standard size shoes and boots in stock but in my experience very few people's feet match the current standard shoe sizes. Therefore if you are ordering either bespoke or standard size footwear then it is best to measure your feet before ordering. So in an attempt to ensure you get the best fit I have included instruction on how to measure your feet and make a foot plan drawing. You will need to get someone to do the drawings and take the measurements for you. Please keep your normal weight on the foot and wearing what ever you will wear, or something similar, when you will be using the footwear. 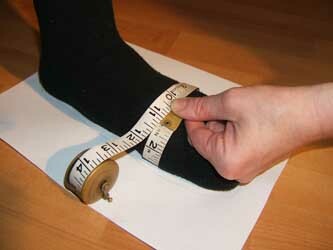 The measurements you take will define the shape and size of your new footwear. 1) Firstly place your foot on a piece of paper on a level surface. 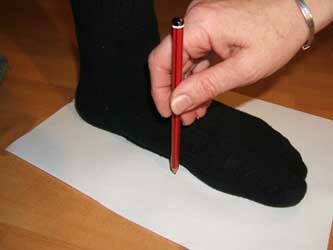 Then draw around the outside of your foot keeping the pencil upright (see foot measurement file). This gives the plan view. 2) Without moving the foot off the drawing measure all the way around the foot to obtain with measurements A and B (see the foot drawing file). On this plan view mark on the drawing where the measurements A and B are taken from and to so I can measure in the same place as you when making up the last. 3) Then repeat this process with your other foot. 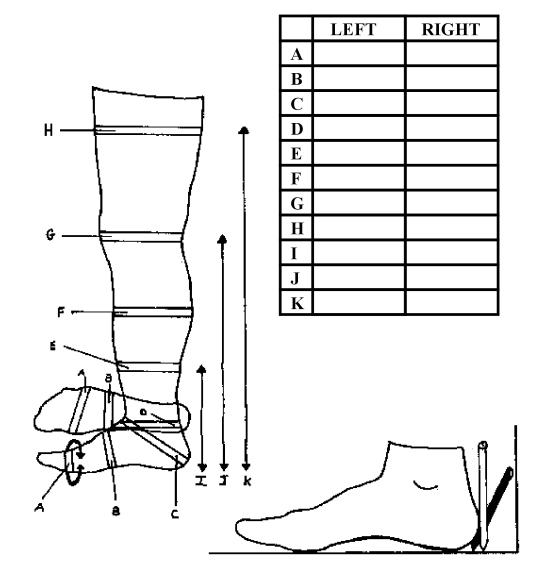 The foot information you send me should be a left and right foot plan view produced by drawing around the foot with the measurements written by the marks that indicate where you took the measurements from and to. When ordering boots please measure your leg, wearing what you would be wearing with your new boots, and record the measurements as indicated on the measurement chart. Please post the the drawings to me to avoid any scaling issues which occur when printing off the drawings from an electronic source. If you need a last to be made up to fit your feet then there is a minimum charge starting at £30.